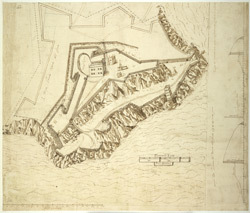 This is a detailed drawing of Plymouth Fort by the Italian military engineer Federico Genibelli. It dates from 1602. Genibelli came to England in 1585 after engineering a sensational, though ultimately unsuccessful, stroke against Parma during the siege of Antwerp where his attempt to destroy a pontoon bridge with explosive ships was noted. He was taken into the Queen’s service in connection with mobilization against the Armada. Although the Spanish were dramatically defeated by the English in 1588, England remained at war with Spain for many years and further attempts to invade were made by Philip of Spain with the dispersal of the ‘second Armada’ in October 1596 and the assembly of the ‘third Armada’ in the following spring. It was therefore important in this climate of continued tension, that defences be in serviceable condition. This drawing was produced after the Privy Council gave instruction that the fort be surveyed following the complaints made by the Captain of the Fort, John Gilbert, that the building works were defective and inadequate. The drawing shows that the fort consisted of two parts, an upper enclosure on the higher ground and a lower one extending down to the shore of Plymouth Sound. The upper and principal fort was roughly triangular in shape but the lower one was extremely irregular, fitting closely to the shape of the rocks on which it stood. Two large bulwarks faced north, inland, to defend the fort against a land-based enemy attack. The main armament of guns was placed in the lower enclosure facing the Sound in order to defend the fort from enemy ships. There was a ditch 20 feet wide along the landward sides. Within the walls were the captain’s house, the soldier’s barracks and the chapel, all are clearly shown here. The defence of the Sound, which gave sea access to the mainland, was the forts primary purpose.